And whilst this is awesome, sometimes you really want to be able to debug a script and go past console.log debugging. If you follow this approach to unit testing your scripts then you can use a couple of techniques to also debug your unit tests (and therefore Mobile Service scripts). I recently purchased a copy of WebStorm during their Mayan Calender end of world promotion (bargain) and it’s a nice tool with built-in node debugging. I asked my team mate Glenn Block if he knew how to use WebStorm to debug Mocha tests. Sure enough, he went off, did the research and posted a great article showing how: Debugging mocha unit tests with WebStorm step by step – follow these steps if you own WebStorm. For those that don’t have a copy of WebStorm, you can still debug your tests using nothing but node, npm and your favorite WebKit browser (such as Google Chrome). 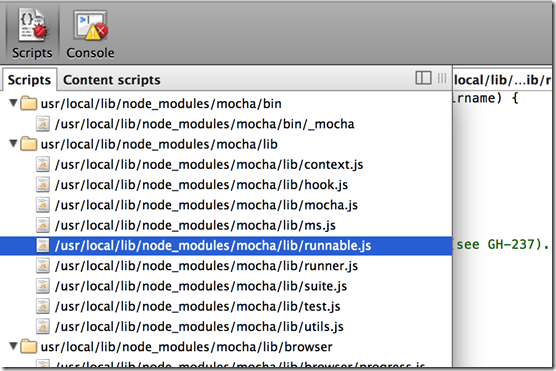 Now, unfortunately the first line of code that node and the inspector will break on will be mocha code and it’s all a little big confusing here for a few minutes, but bear with it, because once you’re up and running it gets easier. The first thing you’ll need to do is advance the script past the line , Mocha = require(‘../’)which will load all the necessary mocha files. Now you can navigate to the file Runnable.js using the left pane. And we’re away. 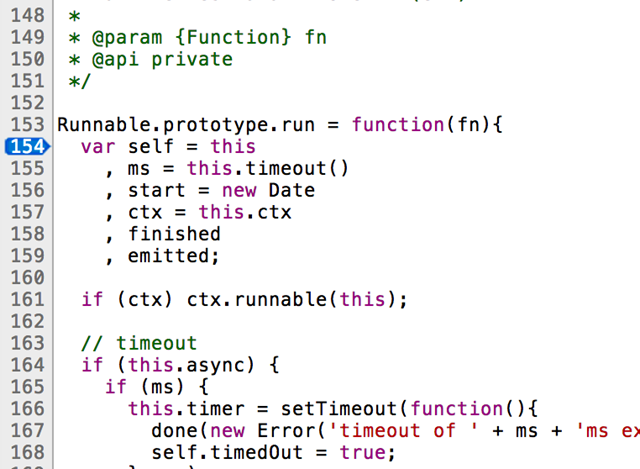 After this, the webkit browser will typically remember your breakpoints so you only have to do this once. 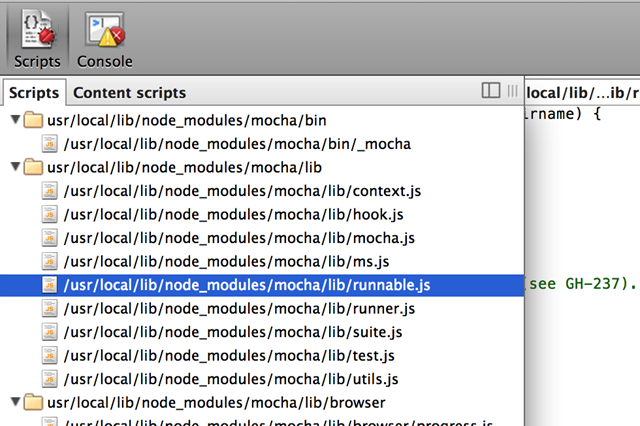 So there you go, debugging mocha with node-inspector. Or you could just buy WebStorm. "Or you could just buy WebStorm." - Not to take away from a good instructional post, but I just checked pricing on Webstorm and it seems like a no-brainer! (Esp. given the quality of ReSharper). Note. 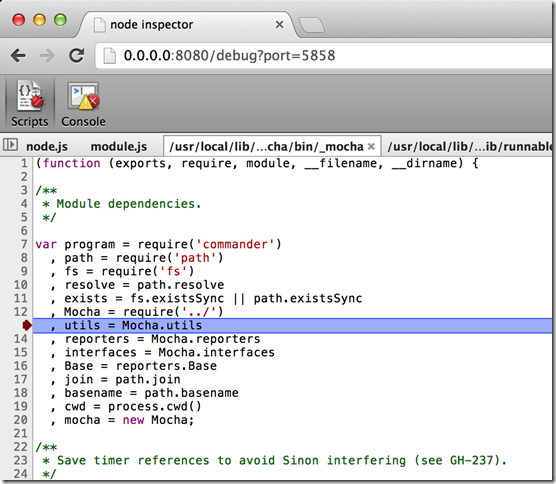 The latest version of node does not allow you to use node-inspector (on Windows 8 anyhow). I went to ver 8.16 and it worked fine!